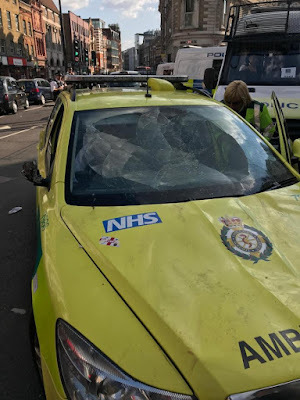 A restaurant worker who was pictured dancing on top of a smashed up ambulance after England’s World Cup quarter-final win has been quizzed by cops. Larissa Bell, 21, from Glasgow, was spending a weekend in London with friends when she was cheered on by booze-fuelled Three Lions fans as she trampled on the vehicle. Police say Larissa, who was identified after the footage went viral following the match, was not formally arrested. It is understood that Ms Bell had been staying with friends in Orpington, South East London, and travelled into the heart of the capital to watch England beat Sweden 2-0 on Saturday July 7. Police appealed to trace a number of people who were seen on top of the vehicle near London Bridge after it was left seriously damaged.